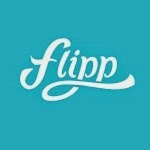 We live life on a budget and the flipp app makes it that much easier to do. No more dirty hands while cruising the flyers every week I can head to my ipad or smartphone to do my weekly shopping. The bonus is my house is becoming more paper free every week! The flipp app has gave a whole new meaning to price matching for me. I can just browse all the local flyers and touch what ever item I want to purchase and the app circles it for me so it makes price matching so easy. Another feature of this app that is just awesome is that I can just search for an item I am looking for and it will show me everyone who has it on sale so I don't have to worry about missing it in one of the flyers. Flipp does the searching for me. Notice above how the app circles the items you are interested in. Also once they are circled they are saved to the clips area so you can access them really quickly without going through the flyers again. I use this feature all the time for price matching that way I do not have to bring all my flyers with me they are on my phone. Don't take it from me though seriously download the app and see how much money you can save while doing your shopping every week. One of It's just my life.... Canadian readers is going to be lucky enough to win a $50 visa gift card from flipp to help with your shopping needs.